It is said that necessity is the mother of invention. I’m beginning to believe it. 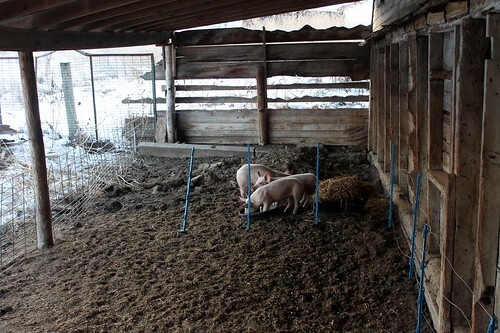 After looking around at other farms and browsing craigslist for the heritage breed pigs that I’d like to have as breeding stock, I ended up buying 3 feeder pigs that are more closely related to the typical commercial pig. Why? Well, you might say that I had a little run-in with necessity. 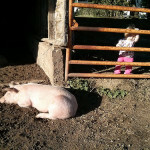 I’m hoping to have some pork to sell early this summer when we’re first making the rounds at the local farmers markets. If I were to spend the $500-600 on a heritage breed sow, it would be almost 4 months before she would have piglets, and a further 5-8 months before the piglets were ready to eat. That’s 9 months to a year before there’s any pork to sell. And all that time I’ve got to pay for the pig feed that she and her piglets will be eating. That’s quite an up-front investment. Instead I decided to start out with a few feeder pigs. Feeder pigs are already about 5-8 weeks old and around 50lbs. They’ll grow up to butcher weight in 4-5 months. That ought to give us some tasty bacon, pork chops and ham to sell right around the start of the local farmers markets. Plus, if being a pig-raising novice leads to any unfortunate mortality, then I’m out the cost of a feeder pig ($45) versus the cost of a heritage breeding animal. Just before we left Missouri I sold an old car for scrap and netted a cool $200. 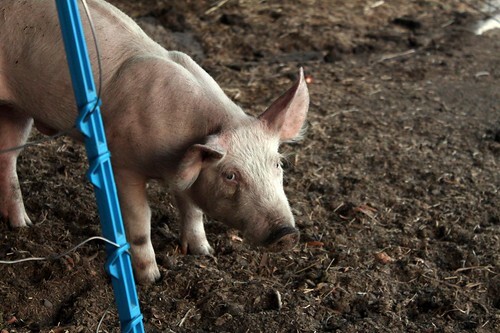 So with that as my pig-raising seed money, I’m off to see how far I can get raising a few pigs on only $200. 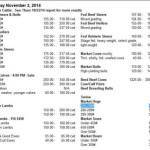 I’m not likely to get them all to butcher weight for that price, but we’ll see how it goes. By my back-of-the-napkin calculations the $200 should last through late March or early April. That’s if I feed them about 1.5lb/hunderedweight/day of pig feed and free choice hay all the time. The $200 figure isn’t exactly a hard and fast limit, as we will only be selling 2 of the 3 pigs, but it’s something to aspire to. I’ve been able to arrange the pigs housing for exactly $0. It helps to be living on an old farm with plenty of old fencing, feed pans, water troughs, and alfalfa-mix hay just laying around waiting to be used. They seem pretty happy in their new digs, even after chewing on the hotwire. After witnessing some very enthusiastic pigs eating a few days worth of kitchen scraps I’m keen on seeing if any local grocery stores are willing to let me dispose of their produce-department scraps. That might help keep costs down. Plus, if I bring them more scraps, this little guy is going to be my BFF. He already loves me for the overripe bananas that I gave him. I predict you’re going to love raising pigs. My admiration for swine continues to grow. Sidenote: Is your farm in the “driftless region?” Maybe instead of investing in someone else’s “heritage” swine, we should make our own heritage. How about “Driftless Red or Driftless Black”? It could be fun. I had to look up “Driftless region” but yes! I am in the Driftless region. I like the idea of a Driftless hog. 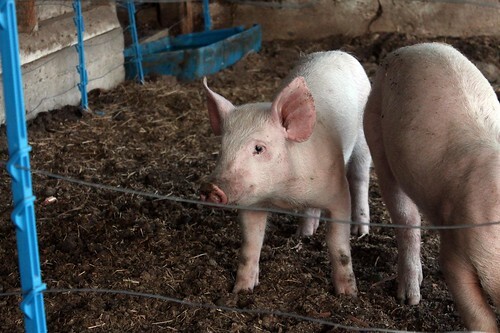 What kind of characteristics would you like to see in such a swine breed? 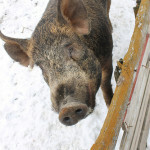 I’d want a pig that’s a good grazer, winter hardy, weans big litters and has a good even temperament. Those characteristics sound great. Eventually we would have to decide on “type”, the visual characteristics because that is what most people think of when they think of a breed. It would probably be better to let form follow function, see which animals are working and let their characteristics shape the type. Are you familiar at all with the Barzona breed of cattle? They’re a breed that was created in a very form-follows-function way, selected only for performance. What they ended up with is a small (1000lb) red cow that is pretty darn consistent looking. 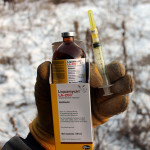 It would be pretty cool to get several people in the driftless region to grow up their own pig herds through linebreeding, with any “new” blood coming from other farmers in the program. With a similar set of selection criteria I bet you could come up with an interesting looking breed of hog within a decade.